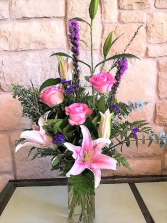 Getting fresh flowers is always memorable and special for your recipient. 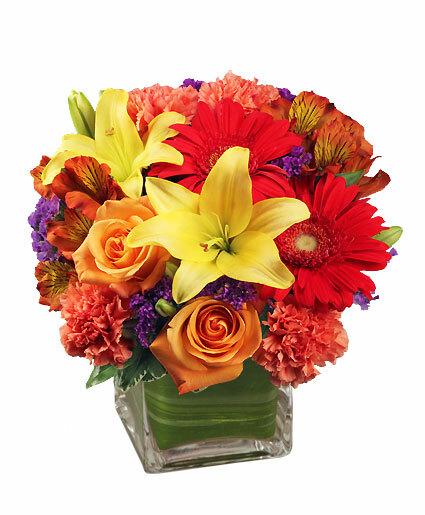 Featuring red gerberas, orange roses and yellow lilies, our BRIGHT BEFORE YOUR EYES Bouquet has just what it takes to bring some fun and show you care! 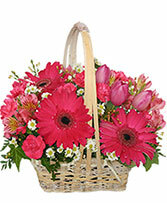 A basket of gerberas, alstroemeria, white asters, mini carnations, and tulips with assorted greens and filler is the way to send Best Wishes. 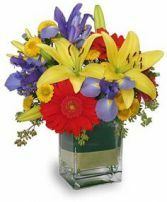 Bright summer colors of gerbera daisies, Asiatic lilies, iris, and buttons with assorted greens and filler in a rectangle vase.